We are pleased to announce the return of our Versatility Ranch Horse workshops at our facility in Tehachapi. We are currently offering two day clinics, each limited to a maximum of 8 riders! All events will include Matt's Body Control Program. Standard clinic topics incluude the following: Ranch Trail, Ranch Riding & Ground Work, Ranch Cutting/Working Cowhorse and Ranch Roping. Cost for 2 day clinics are $225/each and clinics with cattle fees are $300/each. Prices include one clinic ride. Meals and overnight camping are available by arrangement with hosts. Contact us for details. Plan to come, have a good time and learn a lot! Please refer to the Schedule for 2017 Clinics, Demonstrations, and Horse Shows. Clinic participant size is kept to a minimum in order to maximize instruction time during the clinic weekend. It is Matt's desire that riders are provided with the highest quality instruction in the time allotted during at each clinic. Participants are divided into two sessions with a maximum of 10 riders in each. Are you interested in booking a clinic or just wanting more information? Please click here to Contact Us. From beginner to ready for the show pen, Matt can provide the assistance you need. Lessons are $50 when you visit us at our barn. Cattle fees extra when available. Matt also offers limited group and extended sessions. Please call for a price quote. All horsemanship clinics now have 5 Steps to Better Body Control(pdf) program built in. Each clinic level advances body control within the program. This systematic approach teaches the rider how to gain increased accuracy and yielding with minimal effort! Horsemanship 1 is groundwork intensive with some riding. This clinic is offered for a maximum of two days with one evening seminar. At this level instruction is provided as to how to get a horse to yield head, neck, shoulders, and hind quarters from the ground. Emphasis is placed on proper hand and body position to prepare the horse for being ridden or driven. All groundwork compliments the horsemanship under saddle. In this clinic Matt introduces participants to his 5 Steps to Better Body Control(pdf). Students will spend about half the clinic time riding their horses and putting the ground work exercises into practice. Obstacles, "flagging" and preparation for showing in hand may be covered in this clinic. Horsemanship 2 is an extension of level 1 in that it advances the rider in use of the techniques taught at level 1. In this clinic participants work on advancing Matt's 5 Steps to Better Body Control (pdf). Participants focus on learning to control all parts of the horse from the saddle. Emphasis is placed on gaining proper control of the hind quarters and shoulders in a balanced manner. Additional emphasis is placed on building a correct stop, back and turn in a horse for performance purposes. This clinic is good for riders of all disciplines as it lays the foundation for good horsemanship. Riders are given a list of exercises to prepare a horse to do more advanced maneuvers. Horses at this level are typically ridden in a snaffle bit or the bosal hackamore. 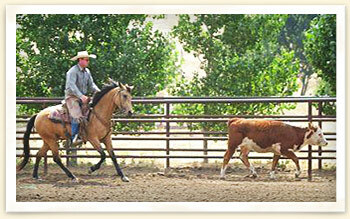 Horsemanship 3 and 4 are the second set of four levels of horsemanship offered by Sheridan Performance Horses. Unlike other systems, you may sign up for any level that you as a rider feel ready for. The "SPH" levels system is designed to give you a guideline for what kind of training may be offered at your clinic. Horsemanship 3 and 4 moves riders forward and prepares them for the more demanding control necessary during advanced riding and performance. All horsemanship clinics now have Matt's 5 Steps to Better Body Control (pdf) program built in. Each clinic level advances body control within the program. This systematic approach teaches the rider how to gain increased accuracy and yielding with minimal effort! At this level participants work on the various exercises needed to prepare a horse for higher level performance. Participants use Matt's 5 Steps to Better Body Control (pdf) to advance into high level yielding of all 8 of the horse’s body parts. Riders learn how to create advanced yielding of the horses head, neck, shoulders, back and hind quarters. Participants develop skills needed to enable horses to perform slide stops, spins, lead departures and lead changes. Emphasis is placed on starting to develop the finished bridle horse. This clinic focuses on the "dry" work that is done prior to a reining or cow horse event. No livestock are required for this clinic. Emphasis is placed on maintaining a balanced rider and horse throughout each exercise. We also recommend this clinic for Dressage, English and Pleasure horses as well. This is the clinic for anyone interested in versatility ranch horse competition. 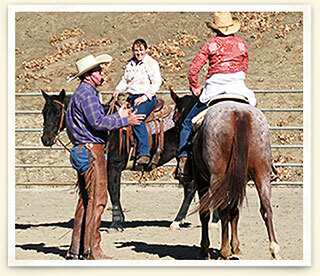 As in Horsemanship 3, participants work on advancing Matt's "5 Steps" (pdf) program. 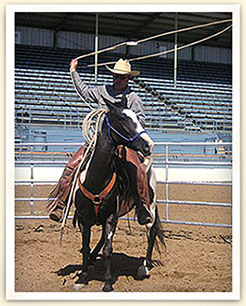 Emphasis is placed on preparing a horse to slide stop, spin and work cattle. As time allows, the clinic may also include work on trail obstacles, ranch pleasure and roping cattle. At this level horses may be ridden in bits other than a snaffle bit or bosal hackamore. Students will learn the basic shots needed to be helpful when roping cattle. Emphasis is placed on building a loop, swing, delivery, and shots that can be thrown. Participants learn no less than two head and two heel shots as well as skills for handling cattle, helping other ropers set up a throw and horsemanship for roping. Roping dummies will also be used for from the ground and saddle practice prior to working with live cattle. In this clinic Matt will help participants learn about working with and handling cattle in a controlled environment. Participants learn the basics of reading cattle, tracking and mirroring, and handling cattle quietly. This is a great clinic for the rider with little or no experience handling cattle or for the rider who is not sure about how to read cattle. Matt also recommends this clinic for riders with younger horses or those inexperienced around livestock. The format of this clinic is two hours per day for two days. Enough time is provided to give riders exposure to what cattle working is all about. This is a fun clinic that usually involves a moderate amount of group activity and participation. * Cattle are required for these clinics. Matt Sheridan Horsemanship Clinics | Copyright © 2017 www.mattsheridan.net All rights reserved.